NAWQA assessments of nutrients—including total nitrogen, nitrate, ammonia, total phosphorus, and orthophosphate—followed a nationally consistent approach in 51 of the Nation’s major river basins and aquifer systems during 1992–2001 (shown in green). Thames Water, the United Kingdom’s largest water utility and Canada-based company Ostara Nutrient Recovery Technologies, will form a partnership to build and operate Europe’s first wastewater treatment facility that removes phosphorus and converts it into commercial fertilizer, WaterWorld reports. American environmentalist Robert F. Kennedy, who sits on Ostara’s board, announced the $3.1 million-deal in an interview with Water and Wastewater International Magazine. Kennedy said the system should be operating by mid-2011. Nutrient recovery will take place at a wastewater facility in Slough, a city on the outskirts of London. Struvite, a compound of phosphorus and nitrogen, will be taken out of the water and turned into pellets that can be used as fertilizer. Roughly 150 tons of the product, called Crystal Green, will be produced each year. The process will save Thames Water between $200,000 and $315,000 annually in maintenance costs, while helping to offset a global decline in phosphorus reserves. Leading producers have all seen output drop in recent years, according to WaterWorld. Removing the nutrients from wastewater will help improve the condition of freshwater bodies, which are subject to algal blooms and de-oxygenated ‘dead zones’ when nutrient runoff is too high. A second facility is being considered in the Netherlands, while three already operate in North America, according to Kennedy. The UK deal was announced the same week as a report on the lack of progress in curbing nutrient pollution in U.S. waters. The U.S. Geological Survey released a national assessment of freshwater nitrogen and phosphorus pollution, concluding that concentrations remain stubbornly high, often two to 10 times U.S. Environmental Protection Agency-recommended levels, especially in streams in urban and agricultural areas. “Despite major Federal, State and local efforts and expenditures to control sources and movement of nutrients within our Nation’s watersheds, national-scale progress was not evident in this assessment, which is based on thousands of measurements and hundreds of studies across the country from the 1990s and early 2000s,” said Matthew C. Larsen, USGS Associate Director for Water, in a press release. 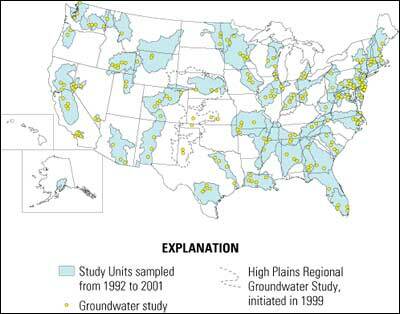 The USGS also found problems with aquifer contamination. In agricultural areas, more than one in five private, shallow wells had nitrate levels higher than is allowed under national safe drinking water standards. But because these wells are not in the federal regulatory domain, it is the homeowner’s responsibility to act.